Hi, welcome back to the Cal-Mil classroom. You may have noticed at Cal-Mil we have both sections and collections, the difference between the two is simple. 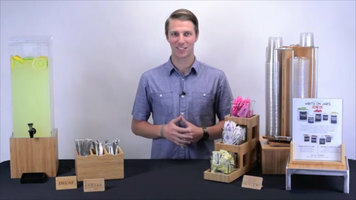 Sections group together products by usage, such as beverage dispensers or flatware organizers, whereas collections group together products by material, such as bamboo or plastic. Out of those collections, bamboo has been one of our biggest hits. With everyone wanting to reduce, reuse, and recycle, our design team wanted to capture not where the trends were, but where they would end up. Three years and a lot of hard work later, we have the bamboo collection. It is an environmentally friendly and fully equipped line that has the assortment of products needed to complete your presentation. All of our bamboo products are finished with a catalyzed varnish to help increase water resistance. That varnish also makes our products easy to clean. Simply wipe down with a damp rag or wood cleaner, and you are ready to go. Choose from our variety of plates, bowls, and signage to make sure your presentation is complete. At Cal-Mil, we have everything you need to make sure your presentation stands out among the rest. Visit cal-mil.com for more information on the bamboo collection. That’s all I got for you, see you next time at the Cal-Mil classroom. Cal-Mil’s bamboo collection is the perfect choice for your presentation! Finished with a catalyzed varnish, these products are easy to clean and virtually water resistant. 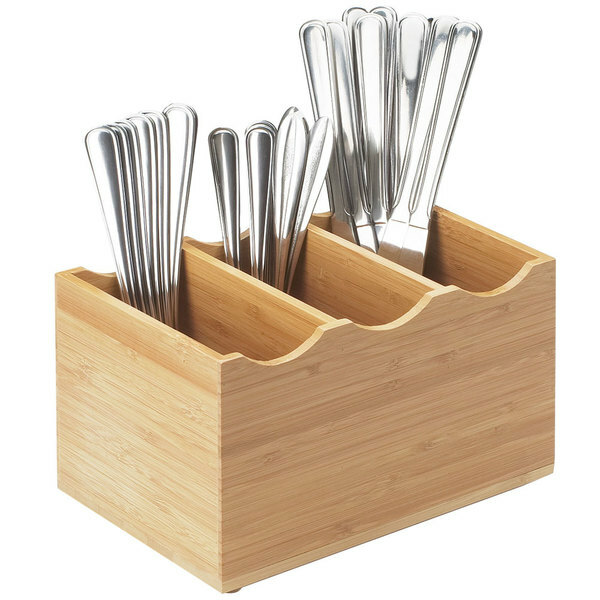 Add eco-friendly organization to your intimate buffet settings with this Cal-Mil 1244 3 slot bamboo flatware holder. This Cal-Mil 1244 bamboo flatware holder is perfect for storing forks, knives, spoons, and other necessary flatware at your breakfast buffet, cafe, deli, or catered event. Its light, natural bamboo construction is both eco-friendly and welcoming. Cal-Mil 166-11-60 Bamboo Rectangular Plate Riser - 20" x 7" x 11"
Cal-Mil 1527-3-60 3 Gallon Bamboo Beverage Dispenser - 8 1/4" x 9 3/4" x 26 3/4"
Cal-Mil 823 Bamboo Crumb Catcher Cutting Board - 13 3/4" x 8" x 1 1/2"
Cal-Mil 1562-2 Change Up Aluminum Rectangular Riser - 21 1/4" x 7 3/4" x 2 1/4"
Cal-Mil 1562-4 Change Up Aluminum Rectangular Riser - 21 1/4" x 7 3/4" x 4"
Cal-Mil 1711-7-60 Iron Black Square Riser with Bamboo Top - 12" x 7"
Cal-Mil 1476-10 Small Square Change Up Steel Riser - 10 1/2" x 10 1/2" x 4"
Cal-Mil 1944-9-60 Bamboo Square Crate Riser - 9" x 9" x 9"
Cal-Mil 796-60 Bamboo Packet / Stirrer Organizer - 9" x 6 1/4" x 4 1/2"
Cal-Mil 284-60 Three Tier Bamboo Display Case with Rear Doors - 21" x 16 1/4" x 22 1/2"
Cal-Mil 1717-60 Bamboo Counter Trash Bin - 5" x 7"
Cal-Mil 1943-7-60 Bamboo Rectangle Crate Riser - 20" x 7" x 7"
Cal-Mil 475-10-60 Bamboo Ice Housing with Clear Pan - 12" x 10" x 6 1/2"
Cal-Mil 1332-12-60 Bamboo Display Bin with Clear Lid - 20" x 12" x 7"
Cal-Mil 1246 Bamboo Packet Organizer - 9 1/2" x 4 1/2" x 2 1/4"
Cal-Mil 432-9-60 Bamboo Square Riser - 12" x 12" x 9"
Cal-Mil 1718-60 Bamboo Four Drawer Bread Case - 16 1/2" x 15" x 15"
Cal-Mil 1338-60 Bamboo Three-Jar Display - 13" x 5" x 5 1/2"
Cal-Mil 298-60 Bamboo Lid Organizer - 4 1/2" x 4 1/2" x 8"
Cal-Mil 1944-6-60 Bamboo Square Crate Riser - 6" x 6" x 6"
Cal-Mil 166-7-60 Bamboo Rectangular Plate Riser - 20" x 7" x 7"
Cal-Mil 1722 Mission Two Tier Merchandiser - 23" x 13" x 15"
Cal-Mil 1562-6 Change Up Aluminum Rectangular Riser - 21 1/4" x 7 3/4" x 6"
Cal-Mil 1943-11-60 Bamboo Rectangle Crate Riser - 20" x 7" x 11"
Cal-Mil 1933-60 Bamboo Building Blocks System - 38" x 12" x 24"
Cal-Mil 1943-3-60 Bamboo Rectangle Crate Riser - 20" x 7" x 3"
Cal-Mil 475-12-60 Bamboo Ice Housing with Clear Pan - 20" x 12" x 6 1/2"
Cal-Mil 1103-811-12 Bamboo Menu Displayette - 8 1/2" x 11"
Cal-Mil 1527-1-60 1.5 Gallon Bamboo Beverage Dispenser - 8 1/4" x 9 3/4" x 17 3/4"
Cal-Mil 1711-3-60 Iron Black Square Riser with Bamboo Top - 12" x 3"
Cal-Mil 1944-12-60 Bamboo Square Crate Riser - 12" x 12" x 12"
Cal-Mil 1318-60 Cupcake Display with Bamboo Shelves - 20" x 20" x 17 1/4"
Cal-Mil 1486 Three Tier Bamboo Jar Display - 5" x 14" x 13"
Cal-Mil 1468 Bamboo Revolving Cup / Lid Organizer - 9" x 9" x 18 1/2"
Cal-Mil 475-6-60 Bamboo Ice Housing with Clear Pan - 7" x 6" x 6 1/2"
Cal-Mil 1476-12 Large Square Change Up Steel Riser - 12 1/2" x 12 1/2" x 6"
Cal-Mil 1711-5-60 Iron Black Square Riser with Bamboo Top - 12" x 5"
Cal-Mil 2019-60 Bamboo Condiment Organizer - 15" x 14" x 9 1/2"
Cal-Mil 284-S-60 Three Tier Bamboo Display Case with Dual Front Doors - 21" x 16 1/4" x 22 1/2"
Cal-Mil 1929-12-60 Bamboo Cube Riser - 12" x 12" x 12"
Cal-Mil 1103-811-60 Bamboo Framed Write On Board - 8 1/2" x 11"
Cal-Mil 2048-3-60 Bamboo Slanted 3 Section Cup and Lid Holder - 4 1/2" x 16 1/4" x 16 1/4"
Cal-Mil 2051-60 Bamboo Slanted 4 Section Cup / Lid / Straw Holder - 4 1/2" x 20" x 19 1/2"
Cal-Mil 1850-4-60HL Mixology Bamboo Three 16 oz. Jar Horizontal Display with Hinged Lids - 16" x 6" x 4"
Cal-Mil 2048-4-60 Bamboo Slanted 4 Section Cup and Lid Holder - 4 1/2" x 19 1/2" x 19 1/4"
Cal-Mil 1850-4-60 Mixology Bamboo Three 16 oz. Jar Horizontal Display with Metal Lids - 16" x 6" x 4"
Cal-Mil 3307-60 Bamboo Straw Holder - 5" x 5" x 3 1/2"
Cal-Mil 3303-60 Bamboo Black Multi-Level Shelf Display - 28 1/2" x 13 1/2" x 36 1/2"
Cal-Mil 3332-7-60 Bamboo Square Crate Riser - 12" x 12" x 7"
Cal-Mil 3301-3-60 Bamboo 3 Gallon Acrylic Crate Beverage Dispenser with Ice Chamber - 8" x 8" x 25 1/2"
Cal-Mil 3308-60 Bamboo Straw Holder - 5" x 5" x 5 1/2"
Cal-Mil 3331-60 Bamboo Square Crate Riser - 9" x 9" x 18"
Cal-Mil 3332-4-60 Bamboo Square Crate Riser - 12" x 12" x 4"
Cal-Mil 3332-10-60 Bamboo Square Crate Riser - 12" x 12" x 10"
Cal-Mil 3374-8-60 Bamboo Stair-Step Riser - 24" x 8"
Cal-Mil 3347-3-60 3-Tier Swivel Display with Round Bamboo Shelves - 12" x 11"
Cal-Mil 2053-60 Bamboo 3 Tier, 3 Bin Condiment Display with Clear Bin Face - 7" x 5" x 16"
Cal-Mil 2054-60 Bamboo 3 Tier, 6 Bin Condiment Display with Clear Bin Face - 10 1/4" x 6 3/4" x 16 1/2"
Cal-Mil 3569-6-60 Bamboo Condiment Holder with Removable Plastic Compartments - 13 1/4" x 7" x 23 1/4"
Cal-Mil 3620-11-60 Bamboo Folding Riser - 10" x 10" x 10 3/4"
Cal-Mil 3620-5-60 Bamboo Folding Riser - 10" x 10" x 5"
Cal-Mil 3620-8-60 Bamboo Folding Riser - 10" x 10" x 7 3/4"
We really like this bamboo flatware holder that Cal-Mil offers. It is extremely fancy and it gives our restaurant tables a new look. I definitely recommend that you try this out. I think you will be just as happy as we are. We love this 3 Slot Bamboo Flatware Holder! The bottom has slip resistant feet on it and when it is stocked with flatware it will most definitely not be sliding anywhere. I use this flatware holder at all of our pop up events and festivals. The bamboo design mirrors our eco friendly compostable serveware and our bamboo serving platters that sometimes display our dishes. I get a lot of compliments on these flatware holders. The bamboo looks amazing and it holds a decent amount of silverware so I don't have to constantly restock. Great flatware holder. Item arrived in good condition and in a timely fashion. I will be using it for company picnic events. Was not very expensive. We were using the plastic containers. These are a real upgrade and we use them for plasticware and straws. Coupled with the condiment holder, the improvement is noticeable! This three slot bamboo flatware holder is great. I can put my forks, spoons, and knives in each slot. It matches the rest of my bamboo holders.